Ladies and gents, I love Brussels sprouts. Ever since my cousin brought a dish of balsamic-braised Brussels sprouts to Thanksgiving two years ago, I’ve discarded my presumptions about this dense mini cabbage-like vegetable and embraced its versatility in the kitchen. When cooked in the oven in a bit of balsamic and oil, the acidic vinegar melds with the sprouts’ natural sugars to create an almost thickened glaze, which caramelizes the crispy exteriors and creates a sweet, tender inside. Finally, tossing the cooked Brussels sprouts in the smoky bacon bits infuses them with that rich bacony flavor we all love. Top it off with a fried egg and you’ve got yourself a real meal. Note: My egg pictured above was a bit overcooked; I recommend going sunny side up for a gooey yolk that will unite all the flavors wonderfully. 2. Cut off stems of Brussels sprouts and halve lengthwise. 3. Toss Brussels sprouts in baking pan with a drizzle of olive oil and enough balsamic to coat and a little more (about 2 1/2 tablespoons). 4. Sprinkle in some salt and pepper, and toss to coat. Bake in oven for about 20 minutes. 5. After 20 minutes, remove pan. Toss in remaining 2 tablespoons of balsamic vinegar and another drizzle of oil, scraping up the bits from the bottom. Place pan back in oven for about 10 minutes. 6. Meanwhile, fry up bacon bits in skillet until crispy. 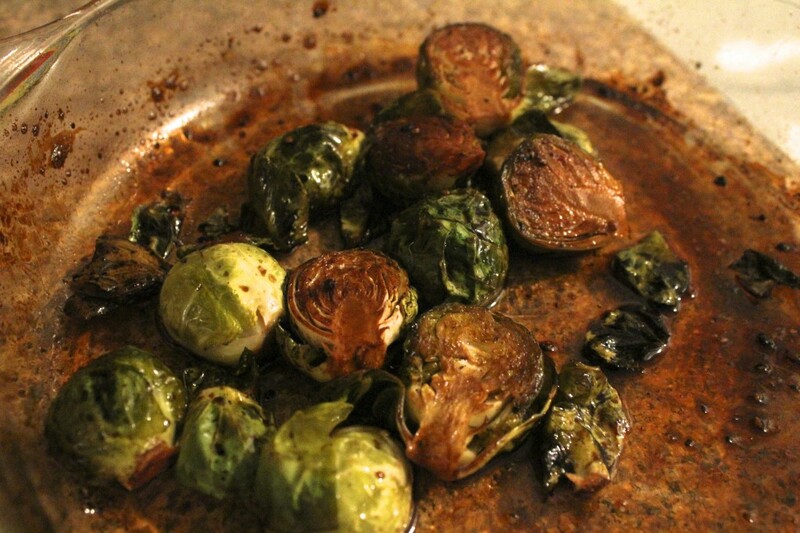 Remove Brussels sprouts from oven, toss in remaining liquid, and spoon the sprouts into the skillet. Tip: I tilted the pan so that the rendered bacon fat would slide under the sprouts and the flavors would meld together. 7. After about a minute, the bacon should be crispy and the Brussels sprouts should have caramelized on the outside. Toss once more and transfer to a clean plate. 8. Wipe down skillet quickly or get a new one and fry one egg. 9. 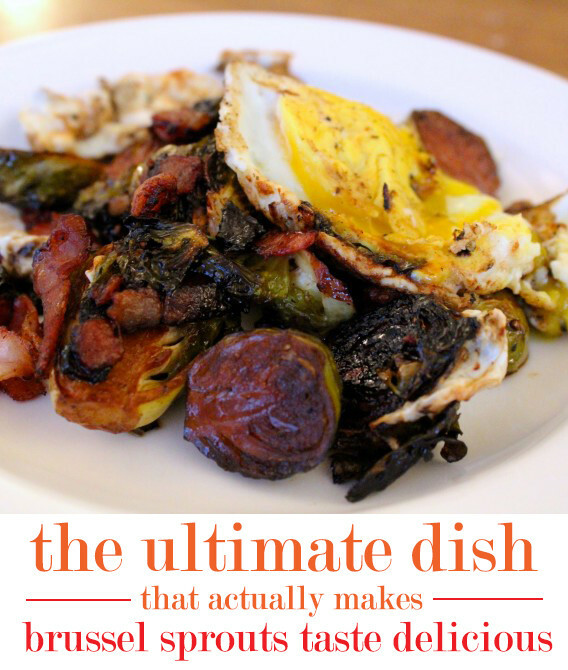 Top Brussels sprouts and bacon with fried egg.